He organized protests against his oppressors, then he had to flee the Western Sahara. Now Omar lives in a refugee camp in the Algerian desert and organizes arts and cultural festivals in the Sahara. When he finally arrived on the Algerian side, he didn't feel any relief. The desolation of the desert, the gloom, the hopelessness - the first days in the refugee camp were more of a shock than a redemption. His old life, Omar says, took place in El Aaiún, the lively capital of the Western Sahara, and was much more satisfying. Today, his home is occupied by Morocco. For the original inhabitants, the Sahrawis, there was only a narrow strip left, the so-called “liberated zone” along the border with Algeria and Mauritania, which the Sahrawian resistance force, the "Frente Polisario", could hold against the Moroccan military. Most of the Sahrawis fled into the desert, to the refugee camps on the Algerian side of the border. Omar chose another way. He went to Morocco and enrolled at the University of Agadir, studying English and English literature. Back in El Aaiún in the Western Sahara, like so many fellow Sahrawis, he couldn't find a job. The Moroccan companies that came with the settlers offered jobs only to Moroccans. Sahrawis had become second class citizens in their own backyard, Omar soon realised. He finally found work in a fish factory. He didn't tell them he's Sahrawi, instead he claimed to be Moroccan. "Working in a fish factory is like slavery," Omar says. "The workday begins at six in the morning and ends at midnight.” He had to carry heavy boxes with frozen fish, day by day, even on weekends. “If you get ill or you complain, you're fired." When the factory went bankrupt in January 2010, Omar decided to join the protests against the occupation of his homeland by Morocco. Together with Sahrawian resistance groups, he launched a camp site in October 2010, just south-east of El Aaiún, near the village of Gdeim Izik. "At first we were just forty people, living in six tents," Omar remembers. "A week later there were already over a thousand protesters." Initially, the camp was only an experiment, he says. They wanted to see if they could carry on their protest for a week, despite all the threats and attacks by Moroccan authorities. "It was very surprising for us to get so much attention and to have such a great influx," Omar says. One month later the camp - with now up to 22,000 protestors - was shut down by the Moroccan military. International media meanwhile referred to the protest camp as the "Camp of Dignity". The Moroccan propaganda of a peaceful settlement of the Western Sahara had received its first major blow. Omar, as one of the organizers, had to flee to escape arrest after the evacuation of the protest camp. Together with two co-organizers, he fled into the desert. For more than two weeks, they relied only on what water and food they could carry with them when they left El Aaiun. At night, when temperatures dropped below zero in the Sahara, they froze bitterly. After fifteen days of exhaustion and in questionable health conditions, they decided to go back to El Aaiún. But Omar's two companions were immediately caught and arrested by Moroccan police, so he fled again into the desert. This time he wanted to make it all the way to Algeria. In that part of the Sahara, the Hamada, there is nothing but sand and gravel; that's why it's called the 'desert in the desert'. Again, Omar was exposed to those hostile conditions, but this time he was on his own. When he arrived at the strictly guarded and heavily mined border wall, the “berm”, that the Moroccans had put up to separate their part of the Western Sahara from the strip that the Sahrawian resistance fighters of the Frente Polisario could hold, it looked like Omar's escape had finally come to an end. But he was lucky – he found a runaway camel. The Moroccan soldiers at the frontier allowed the domestic Bedouin tribes to cross the border to get hold of their animals. Omar gave the Bedouins all the money he had, about five hundred euro, and in return, the Bedouins told the Moroccan soldiers that he belonged with them. They guided him through the densely mined buffer zone along the border wall. A little later, on the “liberated” side of the border, he was found by a patrol of the Polisario, and brought to the Sahrawi refugee camps on Algerian soil. 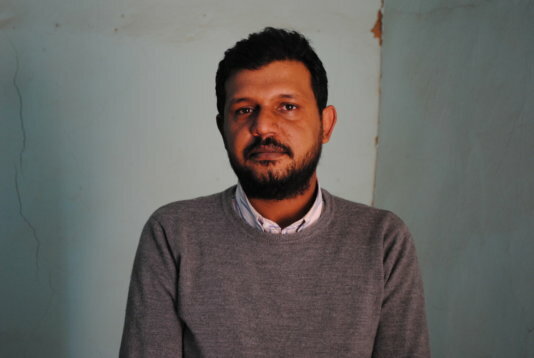 Since then, the 34-year-old lives in exile, in the camps around the Algerian garrison town of Tindouf, alongside an estimated number of 170,000 fellow Sahrawis. Many of his younger countrymen were born here and know their homeland only from TV or Internet. What they see there is daunting. "The daily chicanery, the lack of perspective, the violence, especially against our women. And we have to see how our country, our land treasures are gradually plundered and stolen by the Moroccans." There is resignation resonating in Omar's voice. Maybe he's told the story of his home too often. It's a story of a wealthy country and how little of its wealth is for the benefit of the people who live there. It has the second largest number of phosphate deposits in the world, and just off the Atlantic coast, huge oil and gas fields have been located. In 2012, the European Union and the Moroccan kingdom signed a trade agreement to import agricultural products and to exploit the rich fishing grounds off the coast of the Western Sahara. But recently, in December 2016, the highest court of the European Union dropped that trade agreement because Morocco is not allowed to claim Western Sahara products and services as part of their domestic production, since the annexation of the Western Sahara is not recognized by international law. Meanwhile, Omar has found a job at the Sahrawi Ministry of Culture, which, like all the administrative institutions of the Sahrawi, is located in the camps in Algeria. He works in the media department and takes care of the cultural life in the camps. The highlight, Omar explains, is the international film festival "FiSahara", which takes place every year. And the preparations for the annual art festival "ARTifariti" also keep him busy, he says. “Things are getting better for me now, but I won't call it a happy ending until I can peacefully return to El Aaiun in the Western Sahara." 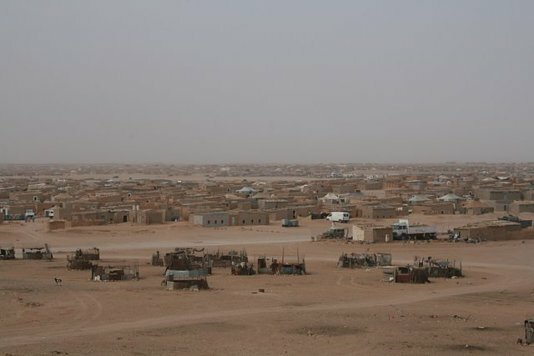 El Aaiún refugee camp in Tindouf. In the foreground you can see goat farms made from metal.